It's moments like these why all of America loves this man. UCLA Bruins legend and current college basketball analyst Bill Walton has been known for his eccentric behavior ever since getting behind the mic for ESPN. Out of all of Walton's crazy actions caught on camera, this one has to be the wildest. 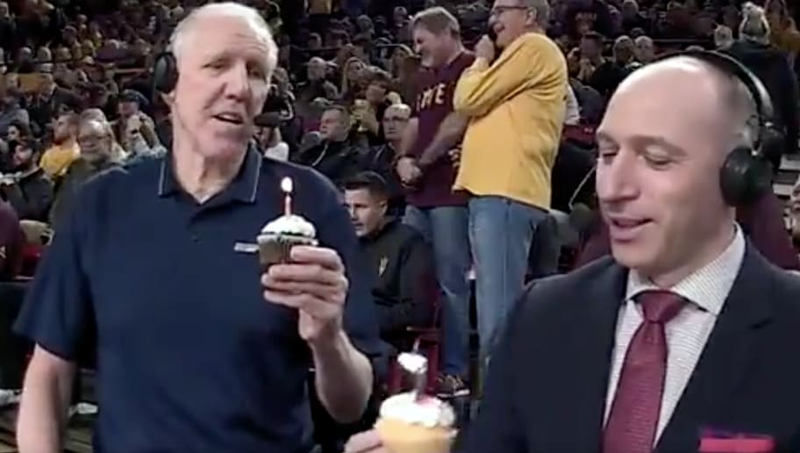 When the Arizona State Sun Devils took on the Washington Huskies on Saturday, fellow broadcaster Dave Pasch joked that Walton should eat the cupcake he was holding while it was lit. Walton seemingly didn't understand that Pasch was joking because without hesitation that's exactly what the former center did. ​​How Walton didn't even flinch, I have no idea. Walton has been on a tear this year for ESPN, as this college basketball season has showcased some of Walton's funniest moments yet. For example, outside of the cupcake incident, Walton decided to make animal noises a couple weeks ago during the Arizona-Arizona State game. Bill Walton is, and forever will be, a national treasure.